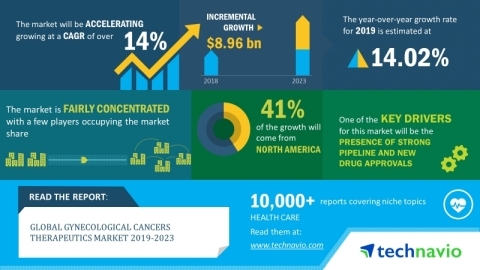 LONDON--(BUSINESS WIRE)--The global gynecological cancers therapeutics market is expected to post a CAGR of more than 14% during the period 2019-2023, according to the latest market research report by Technavio. Several novel therapeutics are in the pipeline for the treatments of gynecological cancers including vaccines, gene therapy, and targeted therapy products. These products are innovative in terms of their advanced therapeutic mechanisms of action, and hence, are expected to transform the course of gynecological cancer treatment. Some mechanisms for these therapies include cell cycle inhibition, angiogenesis inhibition, programmed death-ligand 1 (PD-L1) inhibition, and PARP inhibition. With companies continually focusing on developing new treatments, the gynecological cancers therapeutics market will grow considerably during the forecast period. As per Technavio, the availability of advanced diagnostic modalities will have a positive impact on the market and contribute to its growth significantly over the forecast period. This global gynecological cancers therapeutics market 2019-2023 research report also analyzes other important trends and market drivers that will affect market growth over 2019-2023. Appropriate diagnostics of the disease is crucial for effective disease management. Imaging techniques such as MRI and screening tests such as the Pap test have been the conventional approach to the diagnosis of gynecological cancers. However, advances in molecular biology have led to the emergence of complementary DNA fingerprinting, DNA microarray, polymerase chain reaction (PCR), and molecular profiling efficient diagnostics tools, which make the detection of gynecological cancers possible much earlier. One such advanced procedure includes Fluorodeoxyglucose positron emission tomography/computed tomography (FDG PET/CT), which has established an important role in the diagnosis of gynecological cancers. Such advances in diagnostic modalities will fuel market growth during the forecast period. “Gynecological cancers are one of the most frequently diagnosed cancers in women after breast cancer. At present, the incidence of gynecological cancers such as cervical, uterine, and ovarian cancer is increasing throughout the world. The increasing incidence can be attributed to risk factors such as obesity, viral infections, smoking, and immune system deficiency. Such an increase in the incidence of gynecological cancers will boost the growth of the gynecological cancers therapeutics market during the forecast period,” says a senior research analyst at Technavio. This market research report segments the global gynecological cancers therapeutics market by type (uterine cancer, ovarian cancer, cervical cancer, and others), product (targeted therapy and vaccination) and geographic regions (Asia, Europe, North America, and ROW). The uterine cancer segment held the largest gynecological cancers therapeutics market share in 2018. There are different types of uterine cancer, and the most common one is endometrial cancer, which originates in the endometrium or the inner lining of the uterus. Uterine cancer is the most prevalent amongst all gynecological cancers, and its high incidence contributes to the large market size of this segment. The North America region led the market in 2018 with a market share of close to 39%, followed by Europe, Asia, and ROW respectively. The dominant share of this region can be attributed to the growing incidence of gynecological cancers, the availability of favorable reimbursement schemes, government initiatives, and approvals of new drugs.